Family: Hawk family Accipitridae (ak-sip-IH-try-dee), from the Latin accipiter meaning "hawk or bird of prey." Genus: Buteo (BEW-tee-oh), which is from a Latin word meaning falcon or hawk. Commonly describes a group of medium to large birds of prey that have long and broad rounded wings and short tails. These birds are masters at soaring for long periods of time. Twelve species of buteos breed in North America north of the Mexico border. Species: Regalis (reg-AY-liss), from Latin meaning "kingly" or "royal." These are the largest of the buteos. Common name: Ferruginous (fer-OO-jin-us) means "rusty color" and refers to the coloration of the bird's wing and legging feathers. Geographic Range: Mostly western in the Great Basin and Great Plains. Ferruginous hawks breed from eastern Washington to southern Alberta and southern Saskatchewan, Canada, south to eastern Oregon, Nevada, northern and southeastern Arizona, northern New Mexico, northwest Texas, western Nebraska, western Kansas, and western Oklahoma. Winters across the southwest to Baja California and central Mexico. May show up in the southeast during migration. The ferruginous hawk is the largest buteo in North America averaging 22.5-25" long, with a 53-56" wingspan. Sexes are alike, females average just a bit larger than males. Two color morphs occur, with intermediates. Light morph: Rust colored back and shoulders; head paler, grayish and streaked, and white tail has pale rust wash on end. Undersides are white with limited streaking and rusty spots; leg feathers rust colored on adults, white on juveniles. Large, white crescent-shaped patches occur on the upperwing surface on the primaries. Beneath the wing, large dark comma-shaped patches occur at the wrists. Dark morph: Entire head and body and wing surfaces are dark brown to cinnamon-colored. The yellow gape (mouth) stripe is visible. Upper surface of wing at the base of the primaries shows the white "window", similar to light morphs. Voice: A harsh alarm call sounds like kree-a or kaah. Habitat: Ferruginous hawks are birds of open country. They occur in semiarid grasslands with scattered trees, rocky mounds or outcrops, and shallow canyons that overlook open valleys. They may occur along streams or in agricultural areas in migration. The birds select rocky outcrops, hillsides, rock pinnacles, or trees for nest sites. Nests can be built right on the ground. Nests are built of large twigs or roots. The male collects most of the material, often tugging at roots or attached stems. The female arranges the material and molds the nest cup. Grasses, twigs, old bones, or cow or horse dung may also be used in the nest. In my field work in southern Utah, many of the ground nests could be easily reached on foot. Unfortunately, this means that predators, such as coyotes or foxes, can also reach the nest and prey upon the eggs or young. 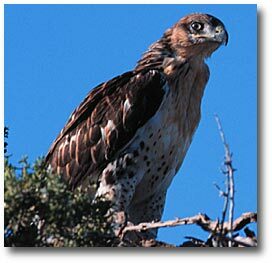 Ferruginous hawks may lay eggs between February and July. Often 3 or 4 white eggs, that are blotched with brown, are laid. Both adults incubate the eggs which take about 28-32 days to hatch. Eggs are laid at two-day intervals; sometimes there may be a two-week age difference between the oldest and youngest fledgling. Some observers have found a difference in the number of eggs laid in a ground nest versus a tree nest, with the tree nest having higher average numbers of eggs per clutch. The number of eggs laid, as well as the number of active nests in an area, may be tied to the abundance of prey. Low prey populations may mean lower reproductive success. Young fledge from 38 to 50 days old. The smaller males may leave the nest 10 days earlier than their female siblings. The adults will continue to feed the fledged young, as well as the nestlings. The young remain with their parents for several weeks after fledgling (10-40 days) before dispersing on their own. Ferruginous hawks rely primarily upon rodents found in their grassland ecosystems. Prey includes Richardson's ground squirrels, white-tailed jackrabbits, black-tailed jackrabbits, ground squirrels, pocket gophers, prairie dogs, and kangaroo rats. Other prey includes snakes, lizards, meadowlarks, grasshoppers, and crickets. In southeastern Utah prairie dogs seem to be the main prey source. The birds tend to hunt in early morning or late afternoon. Birds hunt in four fashions: short distance strikes on prey from the ground, aerial hunting from low altitudes, aerial strikes from high altitudes (300 feet), and flying after prey from a perch. Hunting from the ground appears to be the more successful of the four methods. Since these birds inhabit open country, they can stand by a burrow and wait for prey to appear. Like many raptors, prey is swallowed whole or torn into chunks. The ferruginous hawk then regurgitates a pellet of fur, feathers, bone, and other non-digestible material. Ferruginous hawks may nest in close proximity to each other, less than 1/2 mile away. Other species, like Swainson's hawks or red-tailed hawks, may nest in closer proximity to ferruginous hawks than the 1/2 mile distance. Nesting territories may have a number of alternate nests in close proximity that are used in different years. 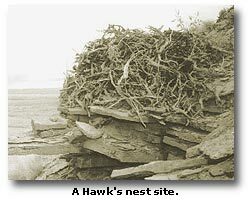 From observations in the Cisco Desert of southern Utah, the hawks appear to favor one nest, which is used in successive years or, at least, the majority of the time. Populations of ferruginous hawks seem to have declined in most areas over their range, except in California where they appear to have increased significantly in the past decade. In Utah, the ferruginous hawk is listed as a State Threatened Species, and is a federal Species of Concern. Occasionally, hay stacks, power poles or nest platforms may be used for nest sites.